Before there were sanctioning bodies, trophies or even cash prizes, the very first automobile races were likely between drivers wanting simply to prove their car was faster than another. Today, such a quaint ideal is all but absent from the high-dollar, sponsor-driven world of motorsports, but there are still exceptions to the rule. One of these is The Race of Gentlemen (TROG), now in its third year. Win here, and there are no cash prizes (although there have been in years past). 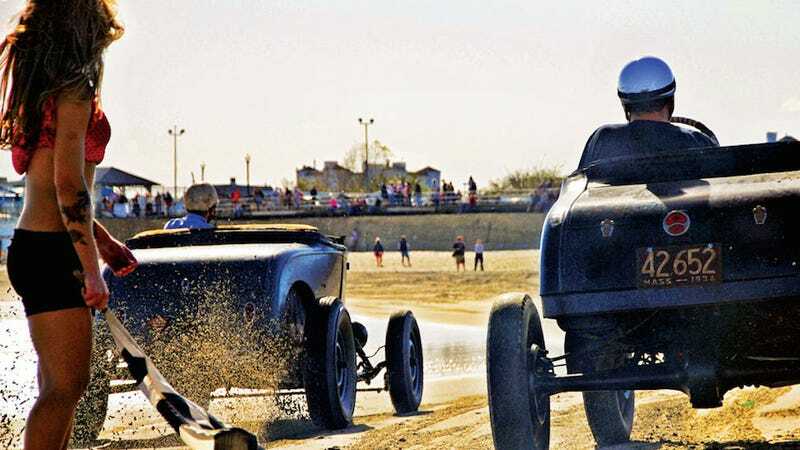 Although there’s a bracket system, it’s not particularly enforced; instead, it’s driver against driver for a waved-flag start and an eighth-mile run down the beach. Win, and you get bragging rights. Lose, and you line up again to redeem yourself. There are only three classes here: bangers (powered by a four-cylinder engine), flatheads (powered by a flathead V-8) and bikes, and horsepower is largely irrelevant. Beach racing is more about finesse than brute force, since drivers are dealing with limited (and ever-changing) amounts of traction. Blow the launch with too much wheelspin, and the likelihood of catching your competitor in an eighth-mile is slim indeed. See more photos from the 2014 Race of Gentlemen in the full Roadtrippers article: After seeing these photos, you'll never miss The Race of Gentlemen again. Also, follow Roadtrippers on Facebook.